Why do so many people struggle to tremolo pick lightning fast? ... thinking that moving your hands faster enables you to actually play guitar faster. You already have more than enough speed in your hands to play guitar really fast (I prove it to you below). What’s holding you back is the distance your pick travels for every note you play on guitar. Most guitarists assume their picking technique is efficient, when it's not. They try to move their pick faster and hope that speed will come one day. To make your tremolo picking insanely fast, you need to increase the frequency at which your pick strikes the string. (This is NOT at all the same as moving your hand “faster” - more on this below). Doing this increases the number of times your pick comes into contact with the string every second. Your tremolo picking speed skyrockets! You can literally double your tremolo picking speed by simply cutting your pick attack distance in half. Now that you understand this concept, here is what else you can do to increase your picking speed. LOOK AT your picking hand when you practice your picking technique! I know, it's tempting to look at your fretting hand, because that's what you've always done. If you spend all your guitar practice time looking at your fretting hand or (even worse) not watching your hands at all, your picking speed will not increase. Step One: Pick continuously using 4 notes per beat (16th notes) at a slow tempo for about 10 seconds (you don’t need to use a metronome for this exercise). Keep your pick angled towards the head of the guitar (where the tuning pegs are) at about a 30-degree angle. This helps you minimize picking motions without sacrificing dynamics or having to pick any softer. Tip: Use a stiff pick (that doesn't flex) to create more power in your pick attack with less effort. Step Two: Now, play about 10% faster and continue picking for another 5-10 seconds. As you do this, keep watching your picking hand and keep your picking motions just as compact as they were in the previous step. This ensures that no unnecessary movement is preventing you from gaining speed. Step Three: Continue increasing the tempo you are picking at while paying close attention to your picking hand and keeping the distance between up/down strokes to a minimum. Don’t sacrifice power and articulation as you shorten the distance in your pick attack. 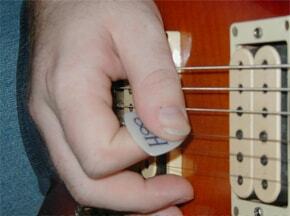 Maintain a high degree of articulation by sticking more of the pick into the string. It allows you to make small picking motions but still maintain a loud, powerful attack (as opposed to picking with the very edge of the pick - limiting your articulation). Your upper arm and picking hand shoulder need to be relaxed when you pick fast. Tensing these muscles makes you tired and more likely to get injured. Concentrate on keeping these muscles relaxed as your speed increases. Continue gradually increasing your speed until you are tremolo picking at the highest speed you can play at. Sustain this speed for 10-15 seconds. Step Four: Rest your hands for 30 seconds and repeat steps 1-3 several more times (for a total of 15-20 minutes of practice). To refine your tremolo picking technique even more, alternate between picking open strings and using fretted notes. This creates different levels of tension on the string and challenges your picking control in different ways). Add this exercise to your guitar practice schedule and work on it on a regular basis to see HUGE results in your speed picking ability. IMPORTANT: Don’t limit this concept of shortening the distance while picking to single string tremolo playing only! As demonstrated in the video above, you should also apply this concept to multiple string guitar licks and scales. This integrates your tremolo picking skills with other aspects of your lead guitar playing and improve your overall speed. Apply the exercise above to the lick below. As you do this, remember to pay close attention to your picking hand to keep your pick attack as compact as possible (while STILL picking the notes with lots of power and volume). Now that you understand how to build tons of tremolo picking speed on guitar, realize that this is just ONE aspect of becoming a faster guitar player. To learn more about the other elements that go into building fast guitar speed, check out this guitar speed mini course. To learn a whole lot more about how to not only build scary guitar speed but also become a highly creative and expressive musician, work together with me by taking online rock and metal guitar lessons. Learn to combine ripping fast guitar speed with tons of musical emotion and creativity in the very best online guitar lessons.